The default WordPress text editor toolbar has some icons that Beaver Builder text editor doesn't, and vice versa. Some WordPress plugins add icons to the WordPress text editor toolbar that don't appear in the Beaver Builder text editor toolbar. Both of these cases are described here. If you're used to working with the WordPress text editor, you might notice some subtle differences in the Beaver Builder text editor. Here's a specific comparison. The Beaver Builder text editor is displayed above and the WordPress text editor is displayed below. This setting makes it convenient to change text size without going to the Text tab and typing in the code. Beaver Builder doesn't use the more tag or the text <!--more--> because it breaks Beaver Builder. Insert a link instead. <s>keyboard shortcuts</s> results in keyboard shortcuts. Use the Alt+Shift+d keyboard shortcut on Windows; Control+Option+d on Mac. You can access a more complete list of keyboard shortcuts in the WordPress codex. 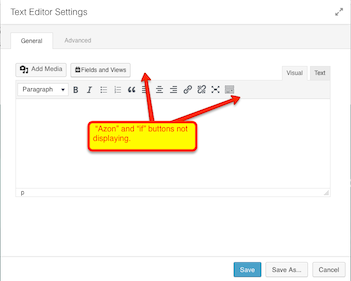 In addition, there can be special buttons or icons on your WordPress editor toolbar for plugins that don't appear in the Beaver Builder text editor. 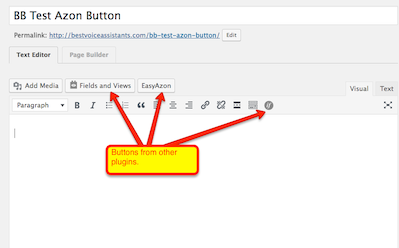 Besides the Pods shortcode button in the previous screenshot, the following screenshot shows some plugin buttons and an icon in the WordPress editor toolbar. Plugin buttons that appear in the WordPress text editor are removed in Beaver Builder because, in WordPress coding concepts, the WordPress text editor operates in the "back end" and Beaver Builder operates in the "front end." Many plugins are only coded to work in the WordPress back end admin area, and when used in the front end, they don't work or even completely break Beaver Builder. The only way to fix this is to contact the plugin developer and request that they make the plugin Beaver Builder-compatible and add the button to the UI with a priority higher than 9999.